Finished it last night and we love it! My first real blanket.A happy blanket. The girls helped me with laying out the fabric squares, 100 in total. We decided to just randomize instead of going with a regular pattern and it turned out just fine! Only the white fabric with shrimp and water melon among other things, is new (IKEA) - everything else we had, I even went looking in my girls' sewing baskets (light blue/white gingham). Since I didn't have time for quilting the blanket, I knotted the layers together using embroidery floss. For the inside I used a 100% cotton woven 'molton'. 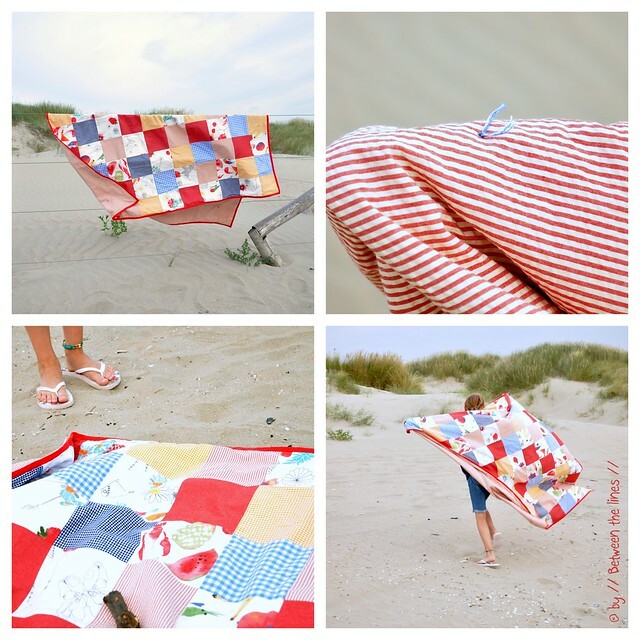 Let's hope the weather will be good enough tomorrow for a picnic at the beach, so we can break in our new blanket (as no food nor dirty feet were allowed on the blanket until some pictures were taken tonight...)!